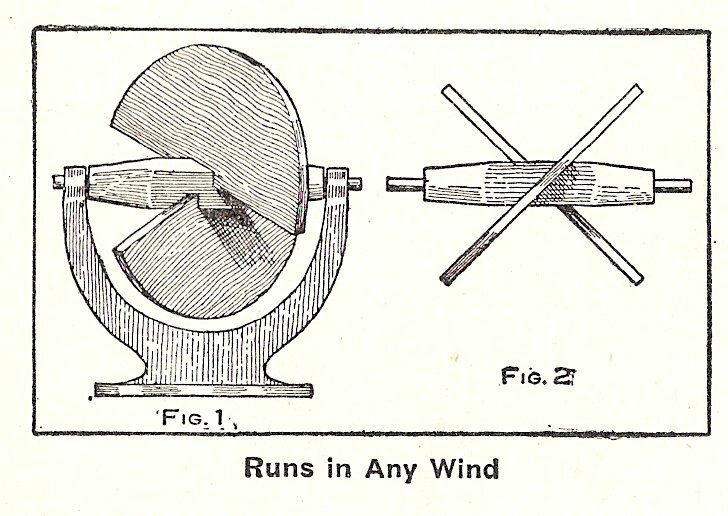 A windmill that can be made stationary and will run regardless of the direction of the wind is here illustrated. mills of this kind can be built of larger size and in some localities have been used for pumping water. Two semi-circular surfaces are secured to the axle at right angles to each other and at 45 deg. angle with that of the axle as shown in Fig. 2. This axle and wings are mounted in bearings on a solid or stationary stand or frame. By mounting a pulley on the axle with the wings it can be used to run toy machinery. I was fascinated by this when I saw it, so I made one. Unfortunately, it does not work well. If the wind is from one end it turns one way; if it is from the other end, it turns the other way. If it is from the side it doesn't turn (consistently) at all.